I mentioned to my parents that they really would love Serbia. "You should really get over here and experience Serbia. It is great, and the people are some of the most friendly people on this earth. Plus your daughter and son-in-law live here; as if you need another reason?!" My father's first question to me . . .
"So, does Serbia have those tasty little breakfast pastries? You know the sweet ones that just crumble and melt in your mouth? Hmmmm . . . . I could really get in trouble with those!" "Ohhh yeah, there is a Pekera (Serbian for bakery) right outside my door. You can find pastries on every corner, dad! Hurry, get here before they all sell out!" Dad assured me he would visit as soon as his schedule allowed, but he rapidly put mom on a plane to taste-test those Serbian delights. We picked mom up Monday morning, and I announced that the following morning, we would take the 6:15 a.m. bus to Belgrade. No rest for the weary - or for the jet-lagged. Get your walking shoes ready! Me and Mom at Hleb i Kifle - Belgrade, Serbia. Mom's a trooper, and her energy and youthfulness often get her confused for my sister rather than my mother. I used to hate that innocent misunderstanding, but now all I can say is, "you go mom! I am sure glad that I have your genes! Now stop smiling, and get ready to walk and sightsee for the next 10 hours!" 6:15 a.m. came quickly, but as planned, we boarded the bus with Darko (a good friend from Subotica) and enjoyed the three hour trip to Belgrade. Our first stop was to check out Hleb i Kifle (actually spelled in cyrillic). I had to prove to mom that the pastries really were as good as I had bragged. Hleb i Kifle did not disappoint, but it left me wondering why in the world Subotica did not have this particular chain? 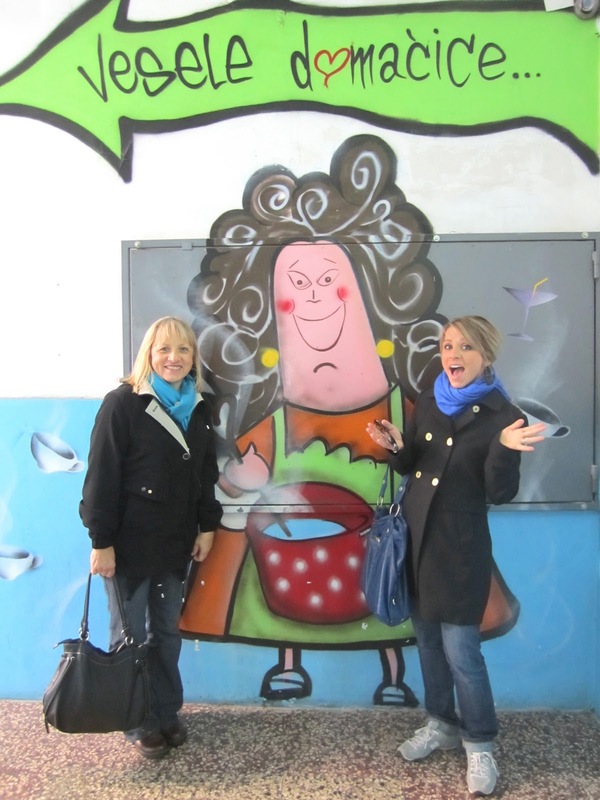 At the "Happy Housewives Cafe" in Belgrade, Serbia. Then in true Serbian style, we started the day off right. With coffee, of course! How fabulous is this cafe?! "Vesele Domacice" literally means "Happy Housewives." Fitting, eh? We were so early, that the city had not come out for their morning coffees yet; nonetheless, we drank our coffee and planned our day. Mom said she could get used to the strong, aromatic espresso that's common place in Serbia. I am certain that the three coffees we had throughout the day helped her forget about the nine hour time difference she was fighting. Mom and Darko and fall colors in Belgrade, Serbia. Mama's Biscuit House Belgrade, Serbia. There was no time to stop and have dessert, but I just wanted to tempt my father with all the sweeties at Mama's Biscuit House. San Marina Chocolate & Pralines Belgrade, Serbia. We did do more than just eat while we were in Belgrade, although it may not seem like it from this post. We saw a lot of famous sites and monuments, but those will be saved for another time. This post is all about the sweeties that we tried in Belgrade, and I think I had my fill for the next month. Our last stop on the trail-of-sweets was to San Marina Chocolate & Pralines. Darko talked the place up, and although the handmade chocolates are pricey, they're more than worth a trip and a few delicious bites. Talk about a sweetie that melts in your mouth! You can choose any sort of combination; dark chocolate with coconut (my personal favorite), doughy-delights dipped in milk-chocolate and rolled in cinnamon, chocolate with hazelnut, and even dark chocolate with chili. Seriously. We did not try the chili-infused chocolate, but it is on my "to-do-list" when Chris and I return to Belgrade. Here are just a few pictures to make your hungry! 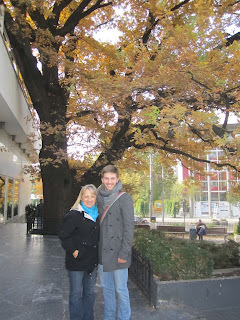 Mom, Darko and I thoroughly enjoyed our trip to Belgrade, and I am sure that I will soon be taking dad on the same route! We are accepting visitors to Serbia, so feel free to drop in any time! I promise to meet you at the airport with pastries in hand. My mouth is watering! You are right, Serbia has fabulous pastries! Although I'm an enthusiast of eating typical Serbian fare, a great bakery to try next time you are in Belgrade is called Roggenart. This is a pekara with bread and pastries done in a traditional Austrian style (actually their recipes are from Austria). I believe they did have two locations, but for sure, the one location I went to is around the corner from Cvetni Trg (one of my favorite areas-close to Beogradanka building). Also, while at Cvetni Trg, for wonderful ice cream (well, maybe in the summer! ), try Bacio---fantastic coffee ice cream and many many other flavors. Sounds like you had a fantastic time with your Mom! Happy travels! Thank you KittySerbia! I love getting an insider-perspective on new cities! Belgrade is absolutely fabulous! My husband and I are planning a weekend there soon - so we will find Roggenart! There's another Roggenart in Vojvode Stepe, however, if you ask me - the best bakeries are the non-chain hidden away ones where they make everything fresh right before your eyes. There is a good one next to Kalenic Market. The one where they roll the pastries behind the counter. I'm along with Zoran here, these new chains are nothing compared to the good old fashioned bakeries. Kiki - thanks for the comment! I just checked out your blog and I love it! As you said, it is always interesting to see another foreigners perspective. I would love to meet you some time!